The last time – well, really the only time – I remember going to the circus was some years ago. The Ringling Brothers were passing through, and I tagged along with some friends. I have to confess a certain amount of bewilderment from the experience. Mostly it seemed to me like a lot of action without a cohesive “story” explaining the performance. Le Cirque des Rêves (The Circus of Dreams) in Erin Morgenstern’s book The Night Circus is a circus unlike any other, shrouded as it is in mystery, and so full of wonders and delights that, visiting, you wonder whether the wonders and delights are real, or merely visions swimming before your eyes. For me, visiting Le Cirque des Rêves (or the Night Circus, as many of its patrons call it, since it is open only at night) was not entirely different from my real-life circus experience: a bit bewildering. 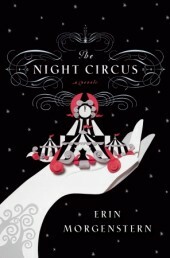 In The Night Circus, two young magicians, Celia and Marco, have been set against one another by their respective teachers in a challenge which they will compete to win. Neither is intended to know their opponent; neither is intended to know that the challenge will only be won by the other’s death. But of course Celia and Marco meet, and quickly discover that each is the other’s opponent. And star-crossed as they are, they fall in love. Aside from the lack of clear direction afforded to Celia and Marco, I found the story a wee bit hard to follow in places, skipping around from one place and character to another, and back and forth through time. Intermittently throughout, the narrative would be interrupted for a description of one of the circus’s many attractions, and while it was enjoyable to visit the circus from so many different perspectives, I never felt like I got to know any single character well enough to really care about them; and for me, the narrative itself was a bit cloudy. I found myself frustrated at times by the lack of clarifying instructions or explanation of why things were happening; the mystery that shrouds the circus itself in the story seems to shroud much of the narrative as well. But the circus attractions! Those were magic. Morgenstern’s vision of this magic circus is almost cinematically vivid in your mind: its sights and smells and sounds; and if for these alone, The Night Circus is worth a visit of your own. This entry was posted in Books, Reviews, and Reading and tagged books, magic, place on January 22, 2012 by ms.grammarian. I have a copy, I really need to get around to reading it.